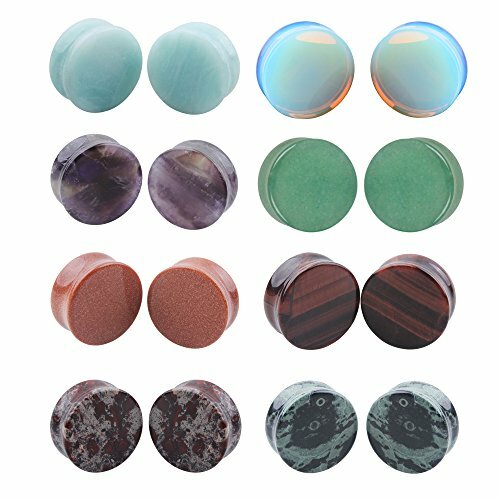 8 Pairs Natural Mixed Stone Ear Plugs Piercing Set Double Flared Saddle Expander Body Jewelry (19mm=3/4'') by MissDaisy at Mas Fashion. Hurry! Limited time offer. Offer valid only while supplies last. Quantity:Each order including 8 pairs ear plugs body piercing in different stone style and same size. Natural stone ear gauges flesh tunnels ear plugs for body piercing. Please be advised that there may be some variance in color and tone,due to the product being made from raw, natural materials. If you have any questions about this product by MissDaisy, contact us by completing and submitting the form below. If you are looking for a specif part number, please include it with your message.